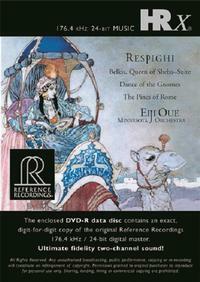 "Dazzling orchestral colors," is one way to describe the music of Ottorino Respighi. Belkis, Queen of Sheba was conceived as an evening-long ballet with singing whose lavishness has kept it from view since its La Scala premiere. this is only the second recording of a suite prepared by the composer - for the first time with the tenor solo (sung by Chad Shelton), and with the movements in the correct order. The music's oriental perfumes and barbaric splendor guarantee the enthusiasm of anyone who hears it. Dance of the Gnomes is a little-known but characteristically dramatic and colorful tone poem.